Those of you that have already navigated to the new inquiries section have already seen an instruction page on how to get inquiries to show up in OwnerRez. While the instructions are fairly clear, I wanted to spend some time explaining how the routing works and the various fringe scenarios you may run into. First, here's a high-level run through on inquiries and how OwnerRez plugs into the process. When an inquirer sees your property on a listing site (VRBO, Vacation Home Rentals, FlipKey, etc) and wants to book it, he uses the inquiry form to send you an email. The listing site shoots off an email message, saying "New inquiry from Joe Blow!" to whatever email address you have on record. Previously, that email message would go to your ordinary email inbox where you would reply directly to it, and also use OwnerRez to generate a quote manually on the side. Once you begin using our inquiry management, OwnerRez will receive that email message directly from the listing site instead. When the message arrives, the body is automatically parsed for inquiry information (guest name, phone number, arrival date, etc) and that information is stored in a new "Inquiry" record for you to review. 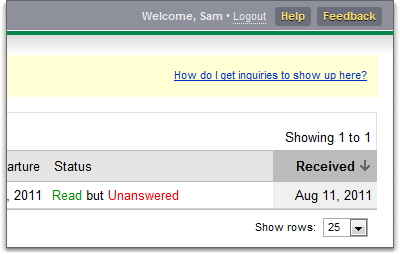 You receive an email alert from our system whenever new inquiries arrive and are ready for you to review and/or answer. You will no longer get the original email in your normal email inbox, because OwnerRez will have received and processed it for you; instead, you'll get the OwnerRez email alert. In order for OwnerRez to receive your inquiry emails, all you have to do is change the email address on file with the listing sites to one that we assign you. That's it. No other actions are required. Listing sites are not all created equal. Some listing sites allow you to specify a custom email address for inquiries for each of your properties. Some only allow you to specify one custom email address for all listings (a different email address than the one you use to login). Some only let you change your login email address and all inquiries go to that. Because of this, we had to come up with two different types of email addresses for you to use so that all scenarios could be covered. The first type of scenario is per property. This scenario covers listing sites that allows you to change the contact info per property. VRBO, HomeAway, Perfect Places and VacationRentalPeople.com are examples of listing sites that allow this. Vacation Home Rentals allows you to have a unique email address per property as long as you have two or more properties. To change your listing on these sites, login and then navigate to the property you wish to change. Go to the "Contact Info" section (sometimes it's under the "Listing Details") and put in the email address that we've supplied you for that property. To find the email addresses we've supplied, visit the Inquiries instructional page. The instructional page is what you see by default under the Inquiries menu until your account has started receiving actual inquiries. Once your account has inquiries, the overview page (or the "grid" page) will contain a "How do I get inquiries to show up here?" link at the top right, above the grid. That link takes you back to the instructions. The second type of scenario is account level. This scenario covers listing sites that only allow you to have one email address no matter how many properties you have listed. FlipKey, VacationRentals.com and GetAwayDigs are examples of listing sites that fall into this scenario. Vacation Home Rentals falls into this scenario if you have only one property. To cover this scenario and make sure that your OwnerRez account could receive inquiries without assigning them to the wrong property, we've supplied each user with a single account-level email address that you can use for these listing sites. To change your listing on these sites, login and then navigate to the account or profile area. Look for a field that is called something like "email address for inquiries". If you can't find a field by that name, you'll need to change the email address associated with the account/profile since that it probably where the inquiries are sent. You can find your account-level email address by pulling up the instructional page again (see above) and looking at the last paragraph, under the table of per-property email addresses. In that paragraph, you'll see an email address in bold. We've designed an inquiry management process that is very easy for users to implement, but there is always room for mistakes. For instance, when copying the per-property email addresses to the listing site, you may assign the wrong address to the wrong property. Please send yourself a test inquiry from every listing that you switch over. It's trivially simple to do, and it will give you visual confirmation that the tracking is working as it should. It will also let you see how the inquiry management works and play with the verification and answer pages. Be patient! Most of the listing sites do not send inquiry emails immediately; instead, they send a batch every 15 minutes or so. It may take a while for the OwnerRez alert to finally end up in your email inbox, even as long as thirty minutes; this is normal. We are working on ways to speed this up where possible, but most of the latency is on the listing sites' end, not ours. If you'd like to see what happens when a non-inquiry message is sent to your OwnerRez email addresses, you can test that too. Simply open your personal email and fire off a message and you'll see what happens. As always, please send us lots of feedback. There is a lot of room for improvement here and we are already hard at work with fixes and enhancements. We appreciate any comments or suggestions you have, whether they be positive or negative.